A few days ago, I ran across this article by Dmitri Nesteruk. In his article, he compared the performance between C# and C++ in matrix multiplication. From the data he provided, matrix multiplication using C# is two to three times slower than using C++ in comparable situations. Even though a lot of optimizations have been done in the .Net runtime to make it more efficient, it is apparent that scientific programming still favors C and C++ because that the performance advantage is huge. In this article, I will examine some matrix multiplication algorithms that are commonly used and illustrate the efficiencies of the various methods. All the tests are done using C++ only and matrices size ranging from 500×500 to 2000×2000. When the matrix sizes are small (e.g. <50), you can pretty much use any matrix multiplication algorithms without observing any significant performance differences. This is largely due to the fact that the typical stable matrix multiplication algorithms are O(n^3) and sometimes array operation overheads outweigh the benefit of algorithm efficiencies. But for matrices of larger dimensions, the efficiency of the multiplication algorithm becomes extremely important. Since Dmitri’s article has already captured pretty detailed data using the standard matrix multiplication algorithm, I will not repeat his findings in this article. 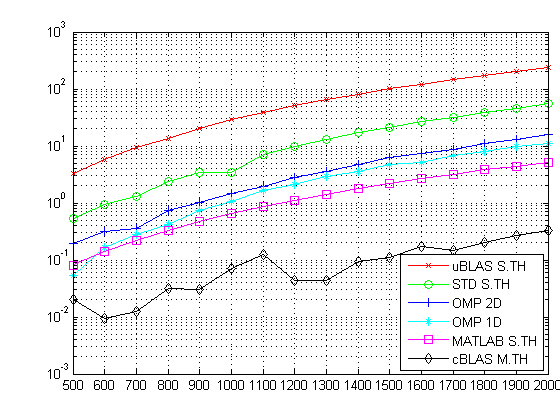 What I intended to show was the performance data of uBLAS, OpenMP, cBLAS and MATLAB. The following sample code are compiled under Ubuntu 8.10 64 bit (kernel 2.6.24.23) on Intel Q9450@3.2GHz. This is our reference code. Later on, I will only show the critical portion of the code and not repeat the common portion of code that initializes/finalizes the arrays. Similarly, the timing method used is also the same across all the tests and will be omitted later on. Using OpenMP, we are able to multiple threads via the #pragma omp directives. For the simple algorithm we used here, the speed increase is almost proportional to the number of available cores within the system. Cache locality is poor using the simple algorithm I showed above. The performance can be easily improved however by improving the locality of the references. One way to achieve better cache locality is to use one dimensional array instead of two dimensional array and as you will see later, the performance of the following implementation has as much as 50% speed gains over the previous OpenMP implementation using two dimensional arrays. Boost library provides a convenient way to perform matrix multiplication. However, the performance is very poor compared to all other approaches mentioned in this article. The performance of the uBLAS implementation is largely on par with that using C# (see benchmarks towards the end of the article). Intel’s Math Kernal Library (MKL) 10.1 does provide functionality to dynamically convert code using uBLAS syntax into highly efficient code using MKL by the inclusion of header file mkl_boost_ublas_matrix_prod.hpp. I have not tried it myself though, but the performance should be comparible to algorithms using the native MKL BLAS interface. By default (without using MKL’s uBLAS capability) though, uBLAS is single threaded and due to its poor performance and I would strongly suggest avoid using uBLAS in any high performance scientific applications. Intel’s Math Kernel Library (MKL) is highly optimized on Intel’s microprocessor platforms. Given that Intel developed this library for its own processor platforms we can expect significant performance gains. I am still surprised at how fast the code runs using cBLAS though. In fact, it was so fast that I doubted the validity of the result at first. But after checking the results against those obtained by other means, those doubts were putting into rest. The cBLAS matrix multiplication uses blocked matrix multiplication method which further improves cache locality. And it is more than thirty times faster then the fastest OMP 1D algorithm listed above! Another benefit is that by default it automatically detects the number of CPUs/cores available and uses all available threads. This behavior greatly simplifies the code since threading is handled transparently within the library. MATLAB is known for its efficient algorithms. In fact it uses BLAS libraries for its own matrix calculation routines. 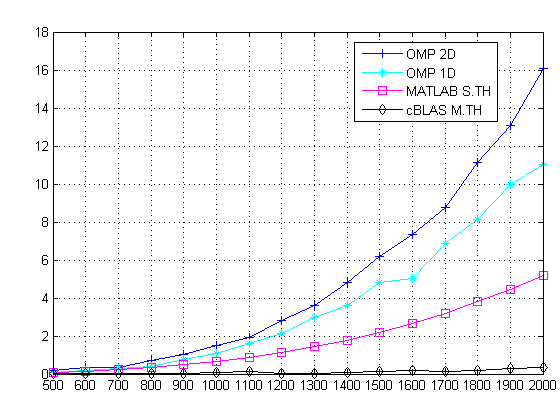 The version of MATLAB I have is a little dated (7.0.1), but nevertheless it would be interesting to see how its performance compares with that of latest MKL’s. MATLAB 7 is single threaded, and given the same matrix size, it runs roughly three times slower than the fastest MKL routine listed above (per core). The following table shows the results I obtained by running the code listed above. The results are time in seconds. (note, S.TH means single threaded and M.TH means multi-threaded). The following figure shows the results. Since uBLAS and single threaded matrix multiplications took significantly longer to compute, I did not include them in the figure below. Nice work. Thanks for sharing this. I was looking for this kind of comparison for a co-worker. I did recommend him to use MKL, but I did not know that the difference was this big. Have you tried the Matrix Multiplication using intel intrinsics functions (SSE,SSE2,…)? To my knowledge, the Intel MKL uses SSE instructions (1,2,3 and 4) extensively, so I wouldn’t be surprised that the matrix multiplication routines utilize these instructions as well. I am trying to reproduce the same results on my own Intel machine. I get a significant speedup with the Intel MKL, but not nearly as good as yours. Can you please tell me which compiler you used (gcc? icc?) and which compiler flags you used? I am using the latest MKL 10.1 and gcc 4.3.2 (64 bit) with -O3 optimization and optimization for Intel Core 2 processor families enabled. The data was collected on a quad core PC (Q9450@3.2GHz) with 8GB memory installed. I wouldn’t be surprised that Intel relied on SSE2 SSE3 heavily and that would explain huge performance discrepancies among different processors. Thank you. I fixed my problem (my compilation flags were not quite right). Thanks for the great blog entry. In every case the latest MKL is about 10* faster than my best C++ code. With the older MKL it is only 2* faster, so I could get close to that my multi-threading. My best C++ code takes about 22 seconds for a 2000*2000 multiply using floats, and 24 seconds using doubles. Since this is on a 1.4GHz machine and I’m not using threads my code might be of interest to anyone who cannot afford MKL and who doesn’t have a multi-core machine or a compiler that supports OMP. The main thing wrong with “naive” multiplication, as implemented by your standard matrix multiplication code is that it utilises the CPU cache poorly, and this effect becomes very pronounced for large matrices. Simply interchanging the j and k loops (which means initialisation has to be done separately) will give a *3 performance improvement. I managed to get a further *2 improvement by using a “blocked” algorithm and unrolling the inner loop. The right values for IBLOCK,JBLOCK,KBLOCK will vary from machine to machine, though there doesn’t seem to be a sharp minimum, and probably depend on the size of the matrices as well. JBLOCK should be a multiple of 16. If you know in advance the size of the matrices you will be using making the values a factor of this size is probably a good idea. Unfortunately my code has got mangled by the comment posting process. i0,j0,k0 should be iterated up to the relevant number of rows and columns as can still be seen in the post, and then either incremented by the relevant XBLOCK variable or equivalently set to the relevant Xmax variable. If anyone is interested I’ll be happy to send the code in an email. Thanks for the comparision; a useful insight. In your comparison, a very old version of matlab selected was. Did you try to compile the ublas code with -DNDEBUG? Because I get those figures only if I don’t use -DNDEBUG. It has its own matrix multiply, but optionally links with ATLAS which uses optimised and hardware specific routines. The Intel MKL library is very fast, but a warning to all of the .Net developers out there. Its a real pig to work with. Intel do provide a sample set of example library calls, but they don’t provide the wrapper. You have to compile it yourself. I am currently using MKL and wish I’d found a proper .Net compliant version or atleast a provider who does recognise that .Net does exist. I’ve wasted so much time trying to get the wrapper compiled for 32 bit then 64 bit. It is not easy. Thank you very much for your article! It helps me a lot. the analysis that is done on quad core PC (Q9450@3.2GHz) with 8GB memory is interesting. Note to a Moderator: Please delete my previous post. Thanks.